For quick turnaround and affordable prices, choose MJ Optical lab for personalized prescription lens surfacing. The MJ Optical lens surfacing lab in Omaha, NE uses state-of-the-art technology and a digital manufacturing process to transfer complex optical designs to the lens surface. The prescription the doctor writes for your customer is completely personalized for their eyes. It makes perfect sense that their lenses should be too. During the digital surfacing process, MJ Optical’s skilled optical engineers transfer complex lens surfaces with extreme accuracy. Traditional progressives use a pre-molded design for every prescription, which results in the same optics being provided to every patient. Traditional tooling also creates “rounding errors” which cause up to .06 diopters of distance power error. Our digital lens surfacing occurs in power increments of .01 diopters, as compared with .1 to .25 increments of conventional eyeglass tooling. Think about the first time you saw high-definition television. Remember how it made your old analog TV picture seem drab and blurry? High-definition technology made colors brighter, shapes sharper, and brought everything keenly into focus. Now imagine your customer having the same experience with their high-definition eyeglasses! Unlike a traditional progressive, the “Platinum HD” customizes the lens power design specifically for each patient’s RX, improving the perceived prescription viewed as the patient moves their eye around the lens. Multiple corridor lengths offer an improved fit based on frame selection. Free-form lenses can maximize the optics built into your lenses, providing brighter and more intense colors. 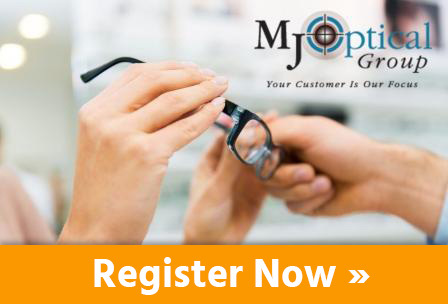 MJ Optical is one of the few remaining independent wholesale optical labs in the country. We are a family-owned business and have been in operation for more than 45 years. Our quality wholesale optical products and state-of-the-art optical surfacing capabilities will satisfy you and your customers’ needs. For inquiries about our lens surfacing, free-form capabilities, optical lab, or wholesale accounts, contact us at 1-800-634-9461.